Silly Sally has many free videos available on her YouTube channel. She has also produced an award winning DVD "Fun With Silly Sally". It will get children up and moving and participating as they sing along. This video is guaranteed to be a hit with your kids. Silly Sally's CD's are guaranteed to keep kids entertained and engaged. There is non-stop fun on both CD's and they come with Silly Sally's famous "Even the Dog Will Love It" Money Back Guarantee! 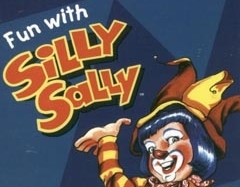 Silly Sally also has many free songs available on YouTube. 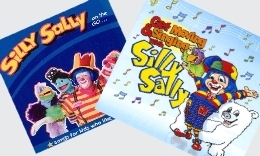 Silly Sally has created many shows that teach and entertain audiences of all ages. 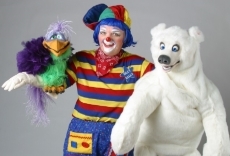 She utilizes magic, music, ventriloquism and dancing, and is available for parties, school shows, library programs, fairs, church events, and more! Sally Shaver DuBois will delight and inspire your audience through laughter and fun! 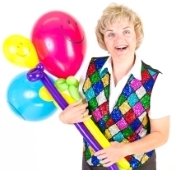 Sally is a professional speaker with a passion for putting SMILES on faces of people of all ages. Attendees will SMILE, LAUGH and LEARN from one of Sally's presentations! Silly Sally is really Sally Shaver DuBois from Ames, Iowa. Sally has been entertaining children since 1997. She has B.S. and M.A. degrees in physical education. Sally is also a professionally trained musician and has played and sung in numerous groups since she was in elementary school. She enjoys playing the drums or singing her favorite songs and especially likes jazz and contemporary Christian music.